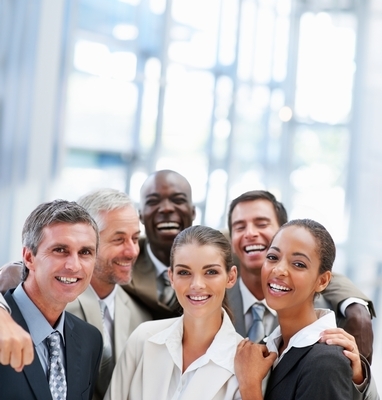 Chris Cook discusses the blossoming science of happiness at work. Q: How can organizations benefit from developing the capital within rather than hiring new employees? A: By helping employees achieve their potential, organizations are setting themselves up to gain a competitive advantage. Their employees will be more productive, creative, engaged and motivated, and they will stay at their job longer and take fewer sick days. This translates to real dollars and a great workplace environment. Who doesn’t want that? Q: You are the only person in the Pacific Northwest to be certified by the iOpener Institute for People and Performance. Can you describe some of the unique benefits this methodology offers? What tools do you have access to that no other consultant in this region does? A: I use the Performance-Happiness Model developed by iOpener over the last six years, which has proven that the 5 Cs—commitment, confidence, conviction, contribution and culture—along with pride, trust and recognition need to be high for people to be able to achieve their potential. The main tool I use is the iPPQ, which measures these eight elements, allowing me to see which areas can be strengthened for people to be happier at work and thus higher performing. Q: How can I take the iPPQ? A: You can go to iOpener to take the free iPPQ and get a two-page report. For a more detailed, six-page report, please email me for a discount code. Q: What are the elements that are necessary for someone to achieve his or her potential? A: We call it the 5 Cs—plus Pride, Trust and Recognition. 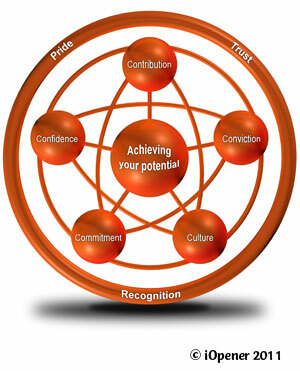 At the heart of the 5Cs lies achieving your potential, while Pride, Trust and Recognition lock everything together. Q: As for the science of happiness at work—how do I know it works? A: There are more than five years of research behind all our tools. This includes running focus groups to identify the questions, three studies, 23 versions and participation by more than 6,000 people. What we have is built on something really solid and evidence-based. That means the diagnoses they produce are correct. The solutions and interventions are tried and tested. The exercises and workshops are practical, and they have been tested and refined with use. Additionally, we have pre- and post-results. 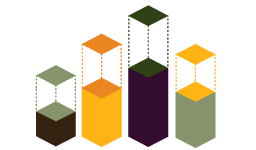 Although we haven’t yet done massive interventions, individuals and small teams have given us metrics and anecdotal evidence that show significant differences between performance and capacity before and after interventions we’ve done. Q: How do I know that it’s happiness that drives performance—not the other way around? A: A meta-analysis (study of 225 studies) showed that happiness comes first (Boehm & Lyubomirsky, 2008). We recently did a mini-investigation into our data and found the same thing: happiness drives performance, and it doesn’t work the other way round. That means driving performance alone won’t make anyone happy at work, and it won’t deliver what people want long-term, either. Q: What’s the difference between happiness at work, engagement and job satisfaction? A: The numbers operate differently; happiness at work predicts performance very strongly. Satisfaction and engagement are weaker predictors. Happiness at work means you have job satisfaction and engagement. But having job satisfaction and engagement doesn’t mean you are happy at work. That suggests happiness is a bigger concept. Our data can show that people report both high engagement and low happiness at work. This suggests they are wrestling with things that are difficult. We think this is because these scores are also associated with low energy. Engagement and job satisfaction are traditionally driven top-down. We think this is a shared responsibility, especially in times of downsizing or rapid growth. Job satisfaction and engagement are concepts that were developed in the 1970s and 1980s when organizations were very different. There are social desirability issues associated with “engagement.” People report that they are engaged because they feel they ought to be. We don’t know of another tool that has been developed in a similar way—from the ground up in a mixed, mobile and educated workforce—the very talent that most large organizations are seeking to recruit. Q: What are some startling stats? Thanks to iOpeners Institute for People and Performance for its ongoing research on happiness, which is absolutely critical for organizations to flourish during these challenging economic times. Boehm, J. & Lyubomirsky, S. (2008, February). “Does happiness promote career success?” Journal of Career Assessment, 16(1), 101–116.